In today's work climate the slightest incident can have profound consequences in terms of liability. Hoisting is closely related to the airline insdustry in that profit and loss is measured in terms of their ability to safely overcome the effects of gravity. With this in mind, companies who employ cranes and related hoisting personnel do carry a heavy burden. ICRSS is committed to the idea of exellence in performance through education. The most valuable asset and the biggest liability a company has is its employees. We specialize in education your liabilities to become assets and thus reducing the risk of financial loss through litigation. 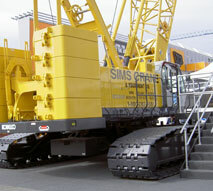 Contact us today and put Isom Crane to work for you.